Using the reverse principles of nanoindentation, this evolutionary system delivers data with high sensitivity over a large force range. The system comes equipped with an acoustic chamber and vibration isolation table to ensure high and low frequency isolation. 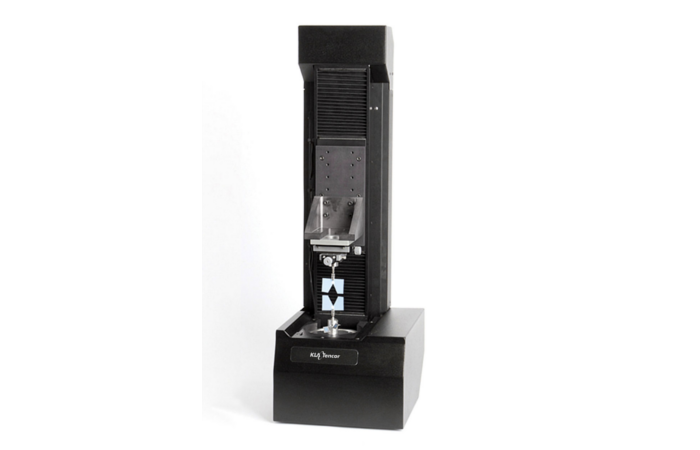 The cabinet is designed for easy access to samples and requires minimal infrastructure. The optional indentation kit allows the system to also be used as an indenter. The T150 UTM is compliant with ASTM standards. It includes the standard method for tensile strength and Young’s modulus measurements of fibers (ATCM C1557). Designed for the characterization of a wide variety of thin fiber and film materials the T150 UTM provides accurate properties in tension, compression and bending tests. Materials such as metal, ceramic, polymer, biological, cotton or wool can be measured for strength, modulus, and yield point with high precision. The unique Continuous Dynamic Analysis (CDA) mode, provides direct and exact measurements of stiffness of the sample over the full duration of the experiment. Enabling users to determine the mechanical properties of the sample as it is strained while also determining storage and loss modulus. The system is upgradable and configurable for a variety of applications such as tension, compression and bending test. The software offers real-time measurements and control. Experiment-specific automation can be programmed with the easy to use software so for test recipes that save time and remove user bias. Faster product development with precise and repeatable failure and strength characterization of single fibers. Waste no time with trial and error extrapolation of properties from tests on bulk materials.